Is this a Dead Cat Bounce? Last time I asked if anyone had seen Santa as markets were in a tailspin a week or so ago. The bulls were in dire need of a Santa Rally alright. And a day late, someone told me he thought he saw him briefly on Boxing Day as he managed to prevent another daily rout by sending the Dow up by 1,000 points. That was close! As it happened, I fully expected that reversal when I sent VIP Traders Club members a note in Monday morning’s Trade Alert to cover some shorts for a huge profit and to look for a rally to the 23,200 – 23,300 zone. And yesterday’s high at 23,400 was just a tad above that zone. 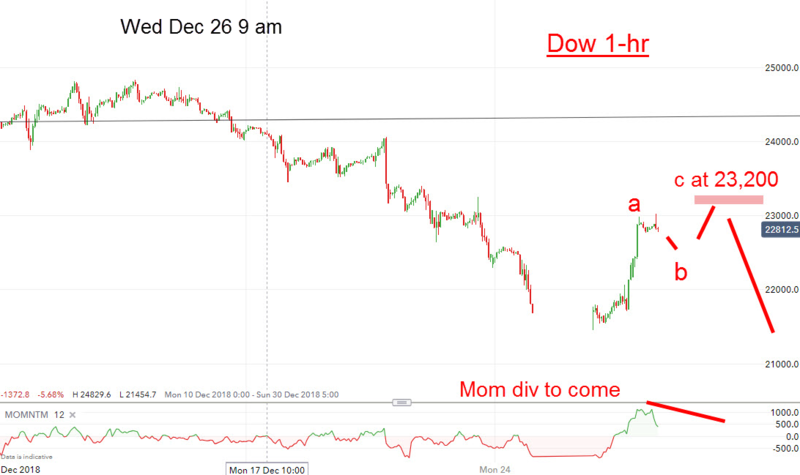 In the context of today’s Dow market that can move by 100 pips in seconds, that was not a bad forecast. 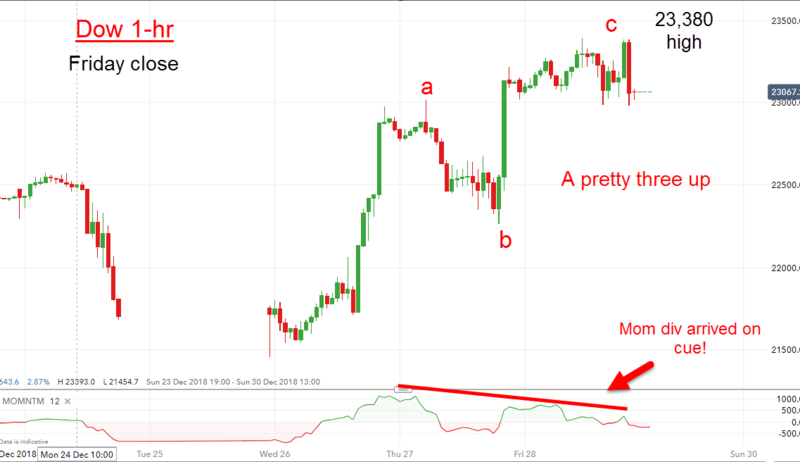 As forecast, the market did rise in an a-b-c to my target zone – and my predicted momentum divergence did appear on cue. Remember, these divergences signify a weakening of the upward thrust into the high and herald a coming decline. Note the very hard plunge down off the high near the close. That target zone sure looks repulsive! Odds are the market is in a third of a third down, which is the strongest and most persistent in the book. In these waves, rallies can be sharp but brief lasting 1-2 days or so – and this one fits the bill provided we see heavy declines next week starting Monday. So how were investors reacting to the abrupt upward reversal on Wednesday? Were they taking the opportunity to unload shares as they recognise the bear is now in control? Or were they Buying the Dip and following the MSM advice not to panic and either sit tight and wait out the storm, or better yet to lap up some bargains. The put/call data (and others) I have seen tells me they were jumping in with both feet, especially yesterday (in a buying panic). There was much MSM coverage of pension funds re-balancing out of bonds and into stocks last week with one mammoth $4 Billion order hitting the screens. And now the MSM is changing its tune from gloom-and-doom headlines to this one I saw today: “Top four fund picks to help investors bounce back in 2019”. They have already suffered major losses in 2018 and the natural desire is to get even. So instead of cashing out, they will re-deploy funds and suffer some more pain next year! Yes, the investment industry wants to keep you fully invested at all costs – especially in a bear market. Whatever the pension funds did (or didn’t do), the bulls managed to push up the Dow by about 25% of the decline off the ATH. That’s pretty substantial, but entirely in keeping with my forecast for sharp relief rallies in an ongoing bear market. Of course,, much of this buying was short covering since DSI bulls numbered a measly 4% last week and that extreme needed correcting. That process is almost over. 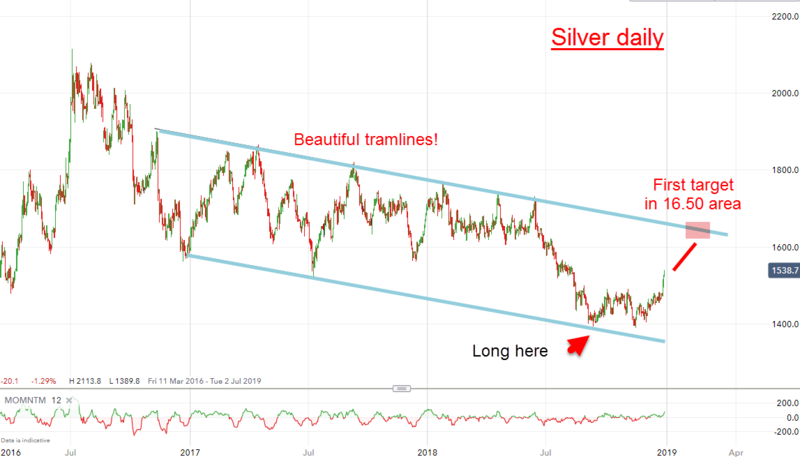 Well under the MSM radar somewhere in the back pages, our long metals positions are quietly racking up some terrific gains. I guess the media are only looking at one other market! We took our first long positions in both at major lows back in August on selling exhaustions when there was hardly a bull in sight. DSI sentiment was well into single figures and the wave pattern suggested a rally phase would start and produce gains over $100 in gold. That was well worth going for. As it happened our first entry was $10 off the low at $1177 and we have been adding to longs since. We are in wave 3 of C and have almost reached my first target just under $1300. 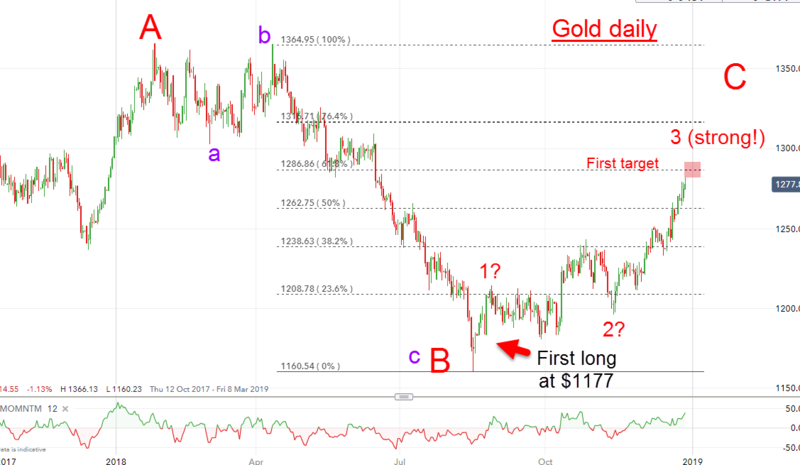 Usually, I would expect a large pull-back in wave 4 down, but if my scenario for a very hard down in stocks near term plays out, gold should remain a haven of safety and we could see a blast past the Fibonacci 62% resistance towards the $1320 region. I have a lovely tramline pair working with multiple touch points on the upper line which is my main target. The DSI bulls data on both metals are creeping up from very extreme bearish levels and when they top, I expect to see extreme bullish readings. We are nowhere near that position yet. In both markets, we are getting into heavy overhead resistance and I expect to see a sharp correction at some point fairly soon. But with silver outperforming gold, it is fulfilling my original forecast. Although these gains are gratifying, I am not getting too bullish. In fact, I do not expect runaway markets as the savage decline in equities will confirm my forecast for a deflationary depression which will impact all assets, including the metals. It is often said that bond traders are way smarter than the equity guys – and sniff trouble ahead of them. 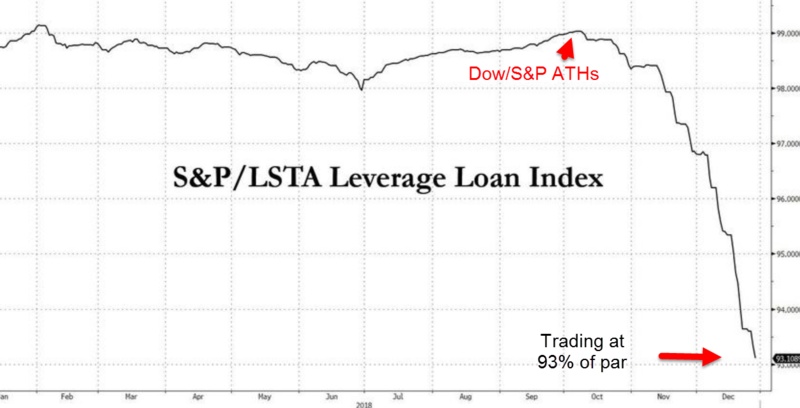 If you think a 20% ‘correction’ in some equity indexes is bad, spare a thought to the leveraged loan traders. So what is a ‘leveraged loan’? As you can see, it can be a very risky instrument. But in optimistic boom times, such as we have just witnessed, these loans are issued by the bucket-load and most trade around par (100% of face value). They carry a high coupon which eager yield-chasers fill their boots with. Pension funds are keen on them (or were). But what do the companies do with funds raised in this way? Why, they buy back their own shares of course! And guess what? The shares are falling and as the economy turns down, they will not be able to pay the coupons and default levels will zoom – and send bond prices even lower in a giant feedback loop. It topped at the time of the stock index ATHs in October and has fallen off the cliff as it now trades at a hefty 7% discount. Not only has the mood for such risky loans changed but redemptions from funds reached an historic extreme last week which forced the funds to sell even more to balance their books. This is an ugly picture – and mirrors the Junk Bond Index chart I showed last time. Only the US Treasury bonds/notes seem immune (so far) to the waves of selling. But I expect that to change soon. Margin calls will proliferate and even ‘safe’ investments, such as Treasuries, will have to be sold to cover them. And that is when most will recognise the bear market for what it is. And that will induce even more selling of the good with the bad – and produce the Crash I am expecting. As in the 2007/2009 Credit Crunch, it was the credit markets that seized up and forced the Fed to impose QE as the major banks faced bankruptcy. Already, credit markets are in the same sort of trouble they were in early in 2007. Then, it was the 110% NINJA mortgage loans handed to anyone with a pulse that tipped the balance. Today, it appears the catalyst is the leveraged loans to corporates. Is the latest China data credible? Up the rabbit hole with Disney! Are we reaching peak mania?